This topic is listed in General Discussion. It has been viewed 30,962 times and 731 replies have been made. 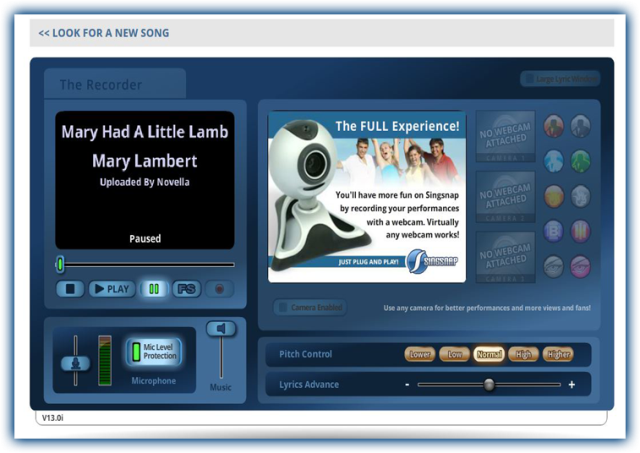 Create Your Own Karaoke Tracks On SingSnap - The Community Songbook Has Arrived! 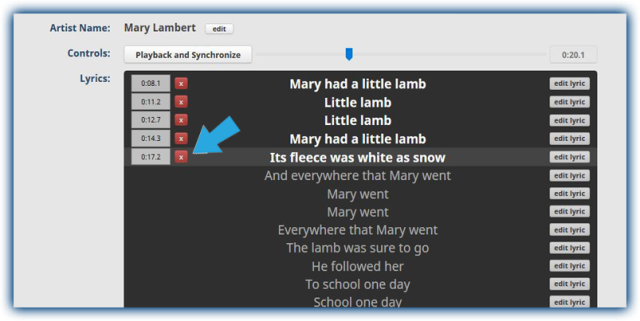 This new feature will allow you to load an audio track, enter the lyrics, sync the two and upload your finished Karaoke track. Now the entire community can sing your creation! Fair use and private copying laws often permit consumers to transfer their lawfully acquired sound recordings to other mediums for their use so you may be able to also upload any song you have in your possession. SingSnap does not provide Copyright or legal advice to it’s members and does not permit copyright infringement. Any concerned rights holders can find our copyright policy here. Check out the brief tutorial below to get started! How Does The Songbook Work? 1. Click on the Upload tab at the top of the site. You will now be ready to upload your first backing track! 2. Enter the required details of the track! The more information you can provide, the better! 3. Now it is time to enter the lyrics. You can even change the color to customize your track! 4. Sync Time! This is where the magic begins! Click the Playback button to get started. 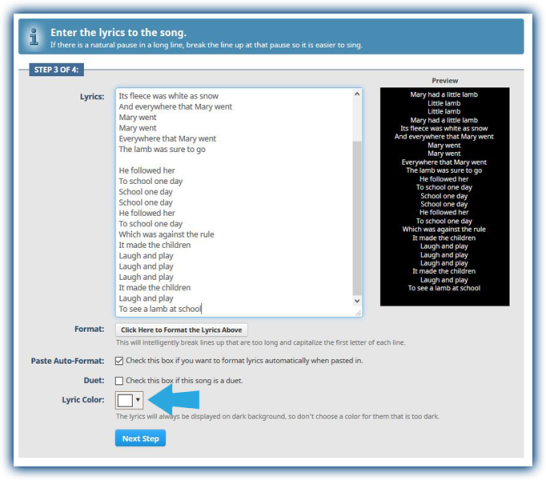 You can also edit any lyric or title errors on this page. 5. Syncing Is Fun! Once you begin the sync process, you can use the features to correct any errors and tweak your track to perfection! 6. Once you are satisfied. Submit your track for processing! 7. Your track will now enter the processing stage. Please allow 5-10 minutes for this step to complete! 8. Once complete, you can find all of your finished songs by clicking on the 'Account' button and then selecting the Manage Songbook link. 9. Your masterpiece is ready to record! We hope you'll enjoy the Community Songbook as much as we do! We look forward to singing your creations! when these are uploaded are they only visible to ourself, or anyone can use them? I just uploaded a tester been processing for quite a while now.. maybe it's on my end. They will be available to anyone. Let me get Rob to check on the processing. Your upload has finished. 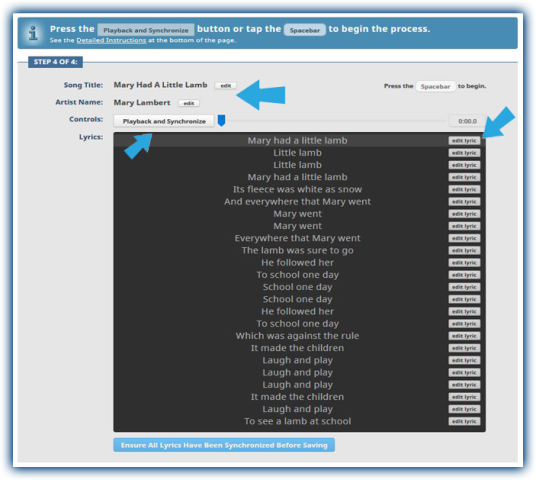 If you need to edit the lyrics and/or sync you can do that from the Account --> Manage Songbook page. Hi - Very exciting!! But I'm not sure that I understand......does this mean that we can upload ANY karaoke tracks that are available, either through the web or on a cd? And then will each of these backing tracts be available for any SS member to use? How will we find out how where these new tracks will be? processed... this is really an amazing feature.. just want to say Thank you to all that put in work to offer this to us.. Just posted first upload, not as easy to make a karaoke track as it looks..lol I got more respect now for those that make them now..
SingSnap does not permit copyright infringement; nor does it provide Copyright or legal advice to it's members. Fair use and private copying laws often permit consumers to transfer their lawfully acquired sound recordings but we can't provide legal advice on each song. Any concerned rights holders can find our copyright policy here. Only the copyright holder of any specific musical work has the right to register a complaint. The law is such that there is no ability for a third party to register a copyright complaint. Regarding your other questions, anyone can upload songs, including blue members. Access to all songs is available for Gold members. Blue members will have access to anything they themselves have uploaded. The tracks will show on the Record --> New page as well as in search results. 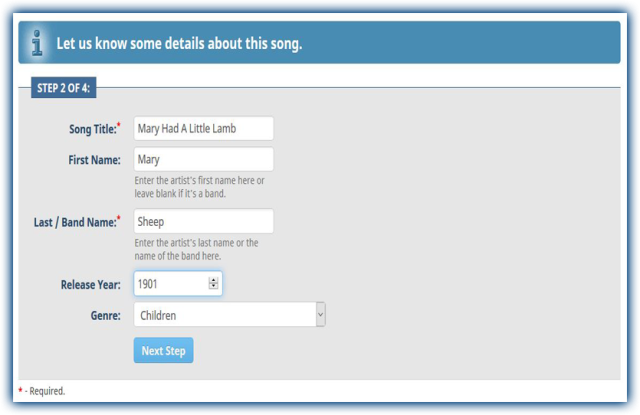 You can filter search results using the advanced options to show or hide songbook songs. I'm sorry to be a pain and have so many questions.. But i have managed to find my songbook or manage songbook, But I am still confused how to find the community one to see the songs that others have uploaded.. (Sorry kid with a new toy) I did read over the tutorial a few times.. I am sure it's there in BIG RED letters and I am missing it . If I'm understanding this.... It brings back what SingSnap meant to me before songs were removed!!! Wow!! Love this!!!!! Wonderful stuff. Got a question though. So, like on "Oh Susannah" by James Taylor, somebody played the guitar, right? A Snapper? Somebody went to the trouble to upload the lyrics and share, right? Is there any way to give credit to those people. Anyway to find out who did what so we can thank them or compliment them? Okay, so it sounds like you can actually upload karaoke tracks you have bought and SHARE them with the SingSnap community, because as you say, "Fair use and private copying laws often permit consumers to transfer their lawfully acquired sound recordings to other mediums for their use." But what about others' use? Should Snappers really assume their recordings on these tracks will stick around? Meanwhile, thanks to Rainbow-Sunshine and Dueter and Rob and BruceNY for sharing and facilitating. These are some gorgeous tracks. Yikes, this is just TOO cool!! BIG thanks to Rob, Novella and all the other peeps at SS World Headquarters who set this up!! I just checked and there are already over 30 songs added today!! Gotta figure out how to do this so I can add some!! This is a super addition to SS, a move to a direct upload to the site. And it looks simple enough that it will be used. I have a large number of backing tracks on my computer obtained in a variety of ways. I note that it appears I am responsible to determine whether a upload would be a copyright infringement. I am in the clear to make a personal use of my tracks. The problem is that for most of them I don't have a right to distribute them.
" You may not copy or reproduce any content obtained from this Website or copy or reproduce any instrumental tracks purchased from the Website except for your own personal use. YOU AGREE NOT TO ALTER, MODIFY, PUBLISH, DISTRIBUTE, SELL, BROADCAST, TRANSMIT ...."
The beauty of SS is that they acquire for us a right to legally distribute our recordings (songs in the SS library, from SS servers only). I am not in any way afraid that an improper upload would result in a copyright holder coming after me. But I highly value my SS account and I don't want to loose it. Copyrights are complicated. I'd like to think that a single mistake would not result in being booted from the site. What An Excellent Move Sing Snap!!!!! I For One Am Loving This!!!! I Will Work Hard At Posting Them On Here Real Soon For Everyone Too Sing And Enjoy!!! Now All I Can Do Is Hope That When I'm Finished? The Sound ( Volume ) And The Words Are Correct... And In Time.. When you load the song, their name will be listed as "Uploaded by.... "
There's also a lot of achievement badges available! Where do you mean play your own and record without having to make files? Let us know what questions you have and we'll be happy to help! I'm confused, too. Do you mean we can upload any music for backing tracks? :::scratches head:::: I don't get it. Feeling rather dumb. Essentially, you're given the ability to create your own backing tracks. So if you have instrumentals to songs - you can upload them to our site and using the tools provided, sync lyrics to lead to your own creation! This sounds way cool! I will have to check this out a bit more! LOL I Was Wondering That As Well.. Currently uploads can't be deleted. I'll PM you and we'll get things sorted out. I hope you can delete what I uploaded because it's a mistake. I was testing it to see how it worked and just uploaded a song thinking I could delete it, but now I see you can't. Anyway, it needs to be taken down, please. I won't make that mistake again! Thanks, Rob! This is AWESOME! WTG SINGSNAP...LOVE THIS. Grandfathered under 13 USC. The existing Sound Choice® track in Children's Songs has only one verse, and Foster wrote five for Christy's Minstrels. Marking in Favorites to track future Replies. Im glad all of you are enjoying this new addition to SS. Sounds great......would love to try it, but fear I might need some help!